Kimmel Quarter is an 11,500-square-metre area that assumes nearly an entire city block in Riga’s Central District. The design proposal aims to revive the brewery site by transforming it into an office building and hotel with public facilities on the ground floor that will bring new life to the area such as a public gym, child care centre, café, spa, food court and convenience store. It proposes restoring facades and strengthening the inherent spatial qualities while shaping the building volumes in a composition that respects the urban scale of the area. By creating beautiful, inviting courtyards and plazas that connect old and new, the overall design will create a strong urban expression with a timeless, classic appearance that is also uniquely modern. Kimmel Quarter is the former home of Brewery Kimmel, a 19th century beer brewery that in its wake left an industrial complex filled with buildings that, while now mostly abandoned, are rich with history. The project called for a design that realizes the vision of a vibrant new city block with deep historic roots. The existing buildings at Kimmel Quarter will remain as unaltered as possible, enhancing the charm and authentic character of Riga’s historical fabric. The new office building’s ground floor is inspired by the arches of the brewery, and with the use of recycled bricks from the site, its material is traced back to history. The architectural expression of the facade of the new office shows a timeless classical appearance in a rectangular grid with a clear visible depth that is often missing in new office buildings. The design aims to create a new composition of building volumes as pragmatic and straight forward as the old industrial complex with a dynamic façade that pushes back and forth and up and down. The resulting architecture is distinctly modern, but in a rewarding dialogue with the old restored buildings. The concept centres on a 30,000-square-metre office building that is open and inviting with direct access to indoor and outdoor public areas with urban qualities and atmosphere. The new design turns the Brewery Kimmel’s former industrial backyard into a vibrant plaza revitalized with a new surface made of recycled bricks from the site, lush landscaping, brick and timber benches, and mirroring water elements fed with water from the roofs. In addition, small outdoor spaces are integrated into the new building for the benefit of the buildings’ employees and everyday passersby. The major roofs serve as larger green areas, and several terraces allow access to the outside from all levels. The roof gardens and terraces atop the new office building function as breakout and bring users of the building closer to nature. 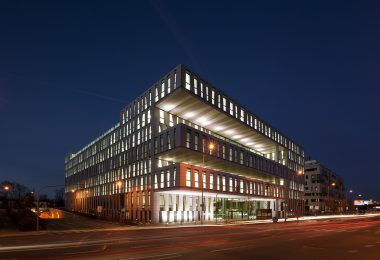 The facades of the new office building are designed to allow maximum daylight deep into the building and secure great views to the surrounding city, while making the interior life of the building visible from outside. In order to avoid over-heating and to reduce the need for cooling the exterior, lamellas provide shading from a substantial amount of direct sunlight. Riga is a city with ambitions of transitioning into a sustainable city with long and short-term strategies that start with the first step of reaching the European Union’s 2020 climate & energy package goals. Kimmel Quarter will become a leader in applying these measures from day one, resulting in a sustainably performing development. 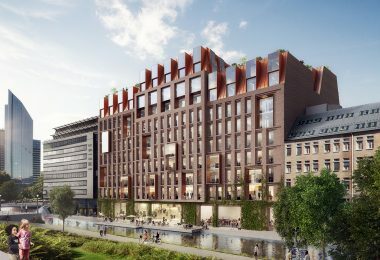 Moreover, having an unflinching sustainability strategy with BREEAM as the driving force, Kimmel Quarter has the potential to become an example for future development of the city of Riga over the next 20 years and beyond.